Two members of a UMOPAR patrol were ambushed in the Chapare region by a group of drug traffickers, according to police reports. 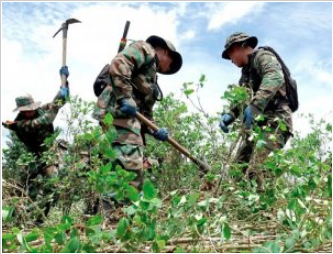 The ambush of a Umopar patrol by drug traffickers in the Chapare region generated controversy. The opposition qualifies as ‘no man’s land’. Meanwhile, the Movimiento al Socialismo (MAS) denied such an assertion, but they see a criminal act, so they will be asked to investigate and capture the perpetrators. However, the identity of a dead resident is kept in reserve. Senator Oscar Ortiz, of the Social Democratic Movement (MDS), said that this fact shows the close complicity between the producers of surplus coca and drug trafficking; meanwhile, legislator Arturo Murillo said that President Evo Morales should order the Public Prosecutor and the Police to apprehend and imprison those involved in the ambush of the police. For the congressman of Democrat Unity (UD) Amílcar Barral these actions demonstrate that the tropic of Cochabamba is no man’s land, that the community peasants, the majority aligned to the Movement to Socialism (MAS) are owners of that territory and that they do not allow to enter the police to investigate these irregularities.